Curry is a staple part of the cuisine throughout East Asia, and its popularity has also stretched into Western countries. Although there's no standard definition for what makes up a "curry," dish, it generally includes meat or vegetables and has a spiced sauce that may feature turmeric, cumin or coriander powder. Depending on what exactly you put into it and how much you eat, curry can be quite healthy or extremely fattening. 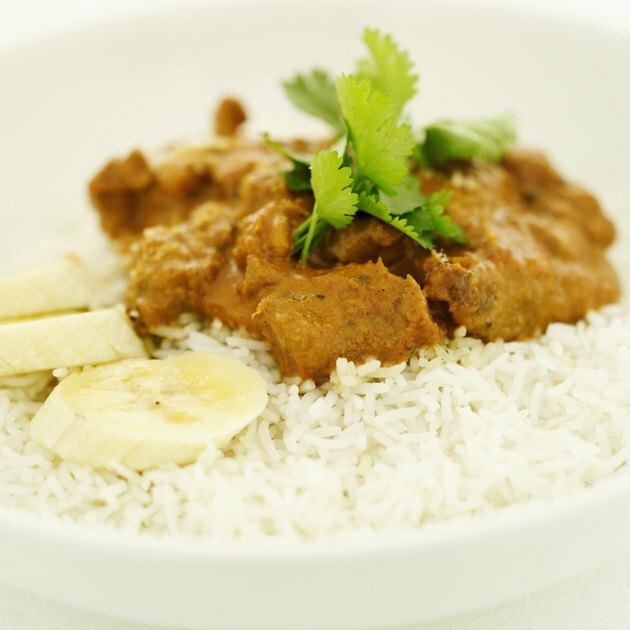 Track the ingredients of your curry dish on a calorie counter app to monitor its nutritional value. Curries that contain main components with high amounts of calories and fat will naturally be heavier than those that feature veggies and plant-based fare. For example, 1 cup of lamb curry has approximately 255 calories and almost 14 g of fat and 90 mg of cholesterol, but the same amount of curried vegetables has just 110 calories, 1 g of fat and 1 mg of cholesterol. Massaman beef cury, a traditional Thai curry with peanuts and a creamy, coconut milk base, has 680 calories and 40 g of fat per cup, while a cup of chicken curry has about 300 calories and 16 g of fat. Ingredients really make all the difference in the final calorie count of a curry dish, which helps determine whether it can make you gain weight or not. To put on body fat, you must consistently eat more calories than you burn. It's possible, therefore, to maintain or even lose weight if you indulge in a rich curry daily, as long as you keep your total calorie count under control; it's also possible to gain weight if you eat a healthy curry dish in addition to your usual fare. To cut down on fat and calories in a homemade curry, use lighter ingredients. The USDA reports that 1 cup of regular coconut milk has 445 calories and more than 48 g of fat, but "light" coconut milk has about one-third of those amounts. If you use oil to sauté or fry curry ingredients, try to use small serving sizes. It can also help to eat curry in small portions and to minimize high-calorie accompaniments, such as refined white rice and fried bread. In the November 2009 issue of "Cooking Light" magazine, recipe developer Danielle Stephenson suggests using low-sodium chicken broth to form a curry sauce rather than using a rich cream base. Any type of "fattening" food can fit into a healthy, balanced diet if you moderate your portion sizes and focus on eating mostly natural, whole foods that are low in fat and calories, and high in vitamins and minerals. To maintain a healthy weight and still indulge in a decadent curry every now and then, keep track of your daily calorie totals with an online calorie counter.